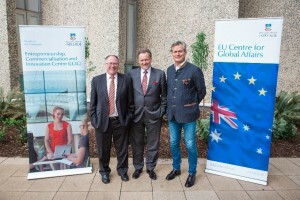 The Entrepreneurship, Commercialisation and Innovation Centre (ECIC) of The University of Adelaide co-hosted with the EU Centre for Global Affairs a national speaking tour by Dr Gunter Pauli, an internationally renowned sustainability entrepreneur from Belgium. 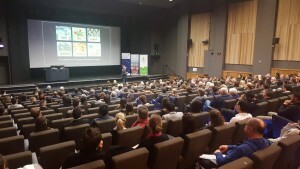 The speaking tour took place between 10 and 17 October 2016, starting in Adelaide and including a series of public lectures, industry events, and workshops in Adelaide, Sydney, Melbourne, Townsville and Perth. 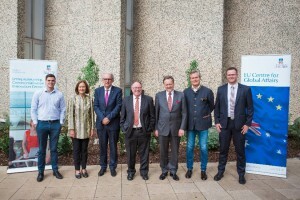 In Adelaide there was a public lecture, industry networking event, and a workshop with University staff and students, the Government of South Australia and Adelaide City Council officials around the application of Gunter Pauli’s work to achieving a Carbon Neutral Adelaide. There is a global consensus forming around the need to achieve sustainable development while growing economies and creating jobs, however there is considerable confusion surrounding how to achieve this in a systemic way. Applying his concept of the ‘Blue Economy’, Dr Pauli demonstrated in all of these public and private sessions how a portfolio of enterprises can be created that generates multiple benefits for business and society while rejuvenating nature. Dr Pauli showed that the ‘Blue Economy’ concept could be applied in any industry sector to generate creative and innovative solutions that strengthen the local economy and harness local skills, capacity and resources. 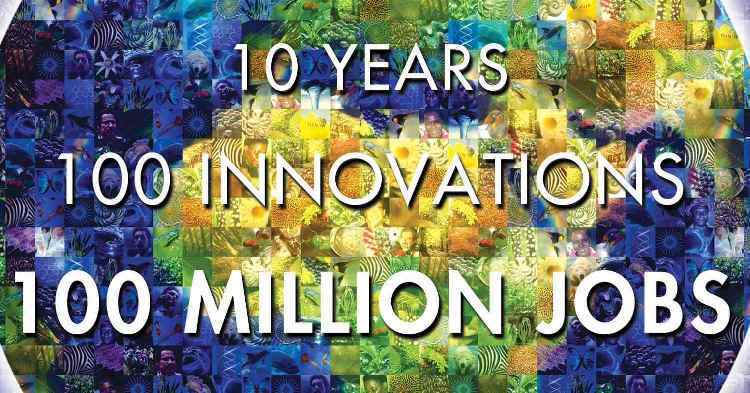 This work has been applied in over 200 locations world-wide and has created over 3 million jobs and attracted over 4 billion dollars in investment. This message was of great interest and was well received by numerous state government and corporate audiences with strong expressions of interest to implement such an approach in Australia. Overall the tour significantly contributed to the profile across Australia of the EU in the area of entrepreneurship and sustainable development, with all events acknowledging the tour funding by the EU. The tour also underpinned development of an Australian Edition of the Book on the application of ‘Blue Economy’ in Australia to be prepared and published by ECIC and the EU Centre for Global Affairs as part of this activity in 2017. Opened by Professor Christopher Findlay, Executive Dean of the Faculty of Professions, the public lecture was preceded by an address from The Honourable Ian Hunter MLC setting a vision for the role that innovation can play in South Australia’s future. Following a vibrant introduction by Professor Noel Lindsay, the University of Adelaide Pro Vice Chancellor for Entrepreneurship, Dr. Pauli delivered a message to an vibrant and dynamic audience, explaining that new and thriving ecologically sustainable industries can be created, with multiple demonstrable examples in practice. Dr Pauli’s presentation of ‘Blue Economy’ innovations and their potential for application in South Australia provided the audience with numerous examples of how to take advantage of locally available resources to transform industries and stimulate economic growth and job creation. Examples included a cost effective alternative to the design and fashioning of paper from rock waste produced by mining and implementing the utilisation of PET bottles, which use no trees or water and are infinitely recyclable. Dr. Pauli presented just 5 of over 200 such innovations with each having not one but many case studies of implementation around the world. Built upon the foundations laid in Dr. Pauli’s public lecture, the EU Centre for Global Affairs and The Entrepreneurship, Commercialisation and Innovation Centre invited the State Government to join the University’s Young Sustainability Leaders for an internal workshop with Dr. Pauli. 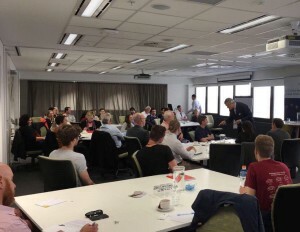 This workshop was a unique opportunity for participants to gain a deeper insight into the concept of the “Blue Economy”, by focusing on applying Blue Economy innovations to South Australia to contribute to the Lord Mayor of Adelaide’s goal of becoming the world’s first carbon neutral city and the State of South Australia achieving zero net carbon emissions by 2050. Placing the University’s leading sustainability students in conversation with senior government officials in this environment has had significant impact in generating momentum for further such engagement. Dr Pauli gave a private presentation to the executive teams of Suncorp from Sydney, Melbourne and Brisbane, outlining a number of Blue Economy innovations relevant to Australia. This presentation was followed by a private operational level workshop-style discussion with the innovation teams from each office, where Dr Pauli delved deeper into his approach of identifying the unique opportunities within individual regions to capture multiple economic and sustainability benefits. Dr Pauli presented over luncheon to an aspirational group of start-up entrepreneurs in the State of Victoria, sharing advice on starting up a business from one of his many mentors, Soichiro Honda. He explained that Honda once told him that when starting a new business and facing large and powerful competition, it is not wise to make lists of the opponent’s strengths and compare them to one’s own as this may make the task seem harder than it really is. Instead, focus on the list of the opponent’s weaknesses, as this will also be very long and more encouraging, in terms of company expense. Dr Pauli described the phenomena of ‘heat seeking’ in the economy, whereby an entrepreneur should identify the existing flows of investment in the economy and identify which are not returning value, for example government subsidies, waste charges and fuel costs. The entrepreneur should see these situations as ‘hot spots’ where a portfolio of opportunities can be created redirecting such cash flows to deliver new value and generate local economic multipliers. Dr Pauli proposed ‘rather than trying to create new waves, surf the existing waves’ and put ‘ethics at the core’ of a business, thereby unlocking potential for a business to evolve into something that would not be possible without a basis of strong ethics. The focus on ethics can create a new framework from which the elements of the business are constructed and the result can be a more resilient business with processes of a much higher value which might never have been discovered before, effectively shifting from a focus on creating ‘Captains of Industry’ to creating ‘Captains of Legacy’ that deliver not only strong economic performance but also a better future. 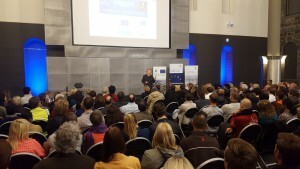 A multitude of guests attended the public lecture and interactive question and answer session at the State Library of Victoria, opened by Marian Schoen, Executive Director of the EU Centre for Shared Complex Challenges. Dr Wendy Lindsay from the Entrepreneurship, Commercialisation and Innovation Centre at the University of Adelaide introduced Dr. Pauli and told the audience ‘he energises us, he stirs our passion and excitement and shows us what we can achieve with assets and resources that are already in our hands’. Australia’s former Chief Scientist Robin Batterham provided closing words and was adamant ‘this is not just a talk, these are not just slides, these are real examples that are happening and these examples show that things can change if we want them to’. Following a lunch with local industry leaders, hosted by Mr Warwick Powell, Founder and Director of Sister City Partners, Dr Pauli participated in a Collective Social Learning workshop facilitated by the world class Integrated Sustainable Solutions team at the Townsville City Council (which provided additional sponsorship support to facilitate this leg of the speaking tour). Held in the Innovation NQ building, the workshop considered the question of ‘How can we take the skills we already have and build community work skills for jobs in our environment and sustainability?’ with Dr Pauli providing a short talk on his work and how it may be applied beneficially to the Far North Queensland Region. Dr Pauli called for a focus on preparing the next generation to be able to operate out of the box to generate new approaches and enterprises. 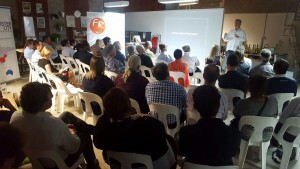 He described a number of cases such as using coffee waste to create a lucrative business in growing gourmet mushrooms, and using light to deliver the fastest internet connection. Dr Pauli called for Townsville to be a ‘Transition Town’ and lead Australia on the uptake of a number of new opportunities that have now been proven, such as rooftop Spirulina farming, as hotels are now practising in Bangkok. The workshop concluded with participants actively declaring personal commitments they would implement going forward. In the subsequent public lecture, Dr. Pauli stressed the crucial need, despite the challenges faced, to always remain positive, arguing that ‘once we humans become negative we will never find the solutions we need’. A group of students from Townsville Primary School attended the workshop and the public lecture with Dr Pauli sharing that while half of his time is spent creating enterprises and furthering innovations around the world, the other half is spent teaching children which he insisted is his most important work. Dr Pauli explained how each of the Blue Economy innovations are translated into children’s fables, as he believes this is the key to achieving a revolution, empowering the younger generation and inspiring the child in all of us. Hosted by Professor Peter Newman from the Curtin University Sustainability Policy (CUSP) Institute, Dr Pauli spoke with a number of staff and students around how the Blue Economy cases could create a new set of opportunities for Western Australia. Staff members from the Water Corporation attended a 2 hour industry session on the opportunities associated with taking a ‘Blue Economy’ approach. With a focus on water, Dr Pauli presented cases of both demand side and supply side innovations from around the world which, for instance have removed the need for water in water-intensive industries including in agriculture and paper manufacture. Professor Robin Batterham is one of Australia’s leading scientists and researchers. He served as the Chief Scientist of Australia for six years between 1999 and 2005. In this position, Batterham advised the Australian Government on all matters associated with science, engineering and innovation. 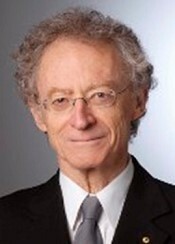 He was responsible for a major research review which produced the blueprint for government support for research in the early years of the 21st century. Before taking on the role of Australia’s chief scientist, Batterham worked at mining giant Rio Tinto and in the CSIRO, also as a chief scientist in the field of mineral and process engineering. As chief scientist at the CSIRO, Batterham led a total of 240 scientists in four laboratories. These laboratories collaborated directly with companies in the mining and metallurgical industries to achieve improvements in performance. After 18 years with the CSIRO, Batterham took up work with Rio Tinto first in the resource and processing developments team and then as vice president of research and technology. Later he became Rio’s global practice leader in innovation before working as Rio’s group chief scientist. In these roles, Batterham undertook a significant number of innovative projects in the mineral-processing field. Rio attributes many of its industrial successes to Batterham’s work in technology development. Batterham is now a Kernot Professor at the University of Melbourne. Here he is responsible for strategic leadership of major projects in energy. His current areas of focus include the application of force chain modelling as a key to energy reduction in comminution and the dewatering of biomass and low rank coals. 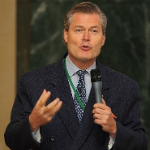 This entry was posted in News and tagged Blue Economy, Carbon Neutral Adelaide, ECIC, EU Centre for Global Affairs, EU Centre for Shared Complex Challenges, Gunter Pauli, Zero Net Emissions. Bookmark the permalink.